Joe Wessels reports that Stan Chelsey will donate $75,000 to keep the pools open another two weeks. As Mayor Mallory stated in the article: this annual temporary fix must be replaced with a permanent solution. I suggest user fees should be implemented. A $1 a day fee to swim is definitely worth it if it keeps the pools better maintained and opened for longer hours. Most people can afford this fee, and Stan could use his donations to pay for tokens for poor children. One problem with the pools is that they are run as if they are only for poor children. They have limited hours, and are not user friendly, and ... they are practically free ($5/year at many, $10/yr at other, more popular pools). I believe a daily user fee would not only generate some funding, but would actually lead to a wider range of users. The way it is now, middle-class families attend private pools like the YMCA or Clifton Meadows Swim Club. Why do they do this? Well, the swim club is open much longer hours, they have competitive swim teams, they have shaded picnic areas and nice shower areas. The kids are better behaved. They do not necessarily have newer or fancier facilities. "A community life exists when one can go daily to a given location at a given time and see many of the people one knows." At a meeting last night, a Cincinnati Recreation Commission staffer stated that an internal decision has been made that deep-water pools shall be eliminated, except when they are at a community center. I have a lot to say about this, but I want to do a little research first about costs and number of community centers. My only question today is: What gives these city employees the right to decide these issues and what informs their decision? The CRC hired a consultant to study the condition of all the pools. I would like to see this report, but according to CRC staff, there is no formal, written report that the public can view. "Just trust us, the report says that the pools are old, and need replacement or removal". How is it that private swim clubs continue to use the same pools for 50 years or more? Oh, maybe they do maintenance. Maybe they value the huge investment made by previous generations. There is a tendency in bureaucracies to have construction projects (capital improvements). The budget for ongoing maintenance and operations is always under siege by politicians and the bureaucrat response is to delay maintenance and then propose to re-build new. That is what we have with the pools, and I accept it as a given. How much more expensive is it to build and run a deepwater pool as compared to a regular pool and compared to the two-different levels of splash grounds? Obviously a simple splash ground with no fence and no lifeguards is very cheap. However, my feeling is that a fancy splash ground/shallow pool, such as the Otto Armleder Pool at Hanna Park is more expensive to build and to maintain as a deepwater pool. But the decision has been made that the deepwater pools will be axed. I think this decision should be challenged. I will discuss in future posts why deepwater pools are so important. 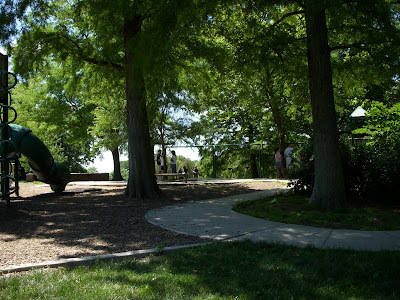 The playground here has two swing sets, and two play structures, all located under the shade of large cypress trees. There is a winding path, seating for parents, drinking fountains, toilets, and picnic tables; all in good working order. Hard to find a Cincinnati Recreation playground half as good anywhere on the west side. We can see around us, from the days preceding project building, many examples of decaying city neighborhoods built up all at once... Every city has such physically homogeneous neighborhoods. Usually just such neighborhoods have been handicapped in every way, so far as generating diversity is concerned. We cannot blame their poor staying power and stagnation entirely on their most obvious misfortune: being built all at once. Nevertheless, this is one of the handicaps of such neighborhoods, and unfortunately its effects can persist long after the buildings have become aged. When such an area is new, it offers no economic possibilities to city diversity. The practical penalties of dullness, from this and other causes, stamp the neighborhood early. It becomes a place to leave. Neighborhoods built up all at once change little physically over the years as a rule. The little physical change that does occur is for the worse - gradual dilapidation, a few random, shabby new uses here and there. People look at these few, random differences and regard them as evidence, and perhaps as a cause, of drastic change. Fight blight! They regret that the neighborhood has changed. Yet the fact is physically it has changed remarkably little. People's feelings about it, rather have changed. The neighborhood shows a strange inability to update itself, enliven itself, repair itself, or to be sought after, out of choice, by a new generation. It is dead. Actually, it was dead from birth, but nobody noticed this much until the corpse began to smell. Finally comes the decision, after exhortations to fix up and fight blight have failed, that the whole thing must be wiped out and a new cycle started... A new corpse is laid out. It does not smell yet, but it is just as dead, just as incapable of the constant adaptions and permutations that make up the process of life. There is no reason why this dismal, foredoomed cycle need be repeated. If such an area is examined to see which of the other three conditions for generating diversity are missing, and then those missing conditions are corrected as well as they can be, some of the old building must go: extra streets must be added, the concentration of people must be heightened, room for new primary uses must be found, public and private. But a good mingling of the old building must remain, and in remaining, they will have become something more than mere decay from the past or evidence of previous failure. They will have become the shelter which is necessary, and valuable to the district, for many varieties of middling-, low- and no-yield diversity. The economic value of new buildings is replaceable in cities. It is replaceable by the spending of more construction money. But the economic value of old buildings is irreplaceable at will. It is created by time. This economic requisite for diversity is a requisite that vital city neighborhoods can only inherit, and then sustain over the years. I don't like it when a childhood haunt is demolished, and I can understand a person expressing sadness at the loss of a neighborhood. But what if you grew up in a disfunctional 15 story housing project with elevators that smelled of urine and broken glass in the dusty playground? I have to admit, I would still be a bit saddened to see it demolished. I hate demolition. I think most all buildings can be saved and improved. That said, some forms of housing are proven disasters, and the most disaster prone is high-rise government housing. Study after study has shown that they are unsafe and unsalvageable. In his ground-breaking studies Oscar Newman used scientific methods to successfully design what he termed "defensible space", something high-rise government housing always lacks. You can read his book for free on the HUD website. ..this "Ghetto Bus Tour" is.. the last gasp in her crusade to tell a different story about Chicago's notorious housing projects, something other than well-known tales about gang violence so fierce that residents slept in their bathtubs to avoid bullets. Turner, a former Robert Taylor Homes resident, has been one of the most vocal critics of the Chicago Housing Authority's $1.6 billion "Plan for Transformation," which since the late 1990s has demolished 50 of the 53 public housing high-rises and replaced them with mixed-income housing. In many ways similar to Cincinnati's City West Project, the Chicago Housing Authority is demolishing Robert Taylor Homes, which consisted of 28 high-rises and over 4,300 apartments and replacing it with a "mixed income" development. This is all part of a Federal Program called Hope VI, which was a controversial program to help Housing Authorities demolish housing. I have concerns about any wholesale change of a neighborhood. To paraphrase Jane Jacobs: "Any neighborhood, built at once, and built to be unchanging, is bound for failure" (I'll try to look up the exact quote later and insert it here). My concern with City West is that it is overly new and built to be unchanging. A mixture of old and new structures is essential to a vibrant city district because small, new ventures require the affordable places that old buildings provide. Only established businesses of large size can afford new construction. Also, the new homes in City West are all wood framed construction with brick veneer fronts and vinyl siding on the sides and rears. This may be expected in the suburban neighborhoods that Drees typically builds in, and it is certainly the cheapest per square foot, however, it seems out of place in a city that is mostly brick. Despite my reservations about the new City West, I am only slightly sentimental about the housing projects that it replaced, and think that a mixed-use, mixed-income project, with defensible space is certainly an improvement. A teacher at Washington Park Elementary tells us that the school will not re-open this fall. The students will be re-assigned to other schools. I didn't see this announced anywhere. I thought it would be open until a replacement school was built, or at least another year. The school had declining enrollment, due to low test scores and less people in the neighborhood, however it was an anchor to the neihgborhood, and it will be missed. 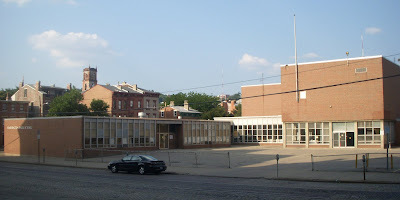 A few years ago there were 3 neighborhood schools in OTR. Now there is just Rothenberg, which is now located on Vine Street, half-way up the hill to Clifton and barely even in this neighborhood. What a shame for a neighborhood that raised so many generations of children. 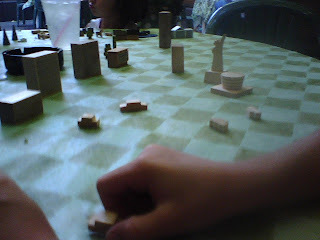 How about some miniture blocks to play with at the restaurant? 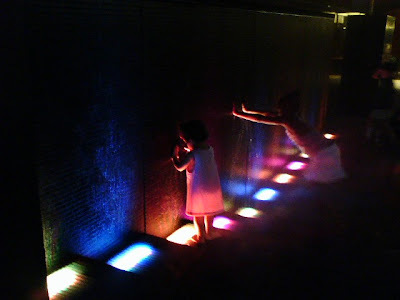 Since I temporarily have no camera, here is a cell-phone photo of kids playing at the water-wall during the movie Saturday night. 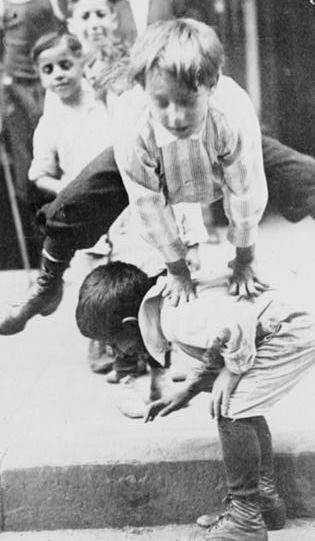 According to UNICEF, the Dutch have the happiest children on earth. Actually, the report only studies the worlds richest 24 countries. How does a country with liberal marriage laws, a drinking age of 16, legalized prostitution, and legalized drugs achieve this? How do they do this with no backyards? After all, this is one of the most urbanized and densley settled countries in the world. I skimmed through the report, and it has to do with the great public schools, the large number of children who live in families with both parents, and who eat together every evening. Parents are encouraged to take 4 day work weeks so that daycare is only needed 3 days a week. Tomorrow, July 14th, we plan on going to the pillow fight (7:30 pm) and Movie (Ice Age, 8:00) Saturday on Fountain Square. Anyone else want to meet up? A neighbor of ours from Elm Street was struck dead a few days ago while trying to cross Liberty Street. Miss Anna was of those people who seem to be permanent parts of your block; always there, watching everyone and making small talk. Elm Street got a bit poorer today. An 85-year-old was killed Saturday while trying to cross a street in Over-the-Rhine, Cincinnati police said. Anna Pace of Over-the-Rhine was crossing West Liberty Street near Pleasant Street when she was hit by a pickup truck about 3:45 p.m. She was not in a marked crosswalk, police said. She was taken to University Hospital, where she died. I don't yet know the details, however I can pretty much guess she had just finished picking up a few items at Findlay Market and was walking home, down Pleasant, which continues on both sides of Liberty, but where there is no light. Many people cross here, and you will often see people dodging the traffic. Liberty Street is the most dangerous street in the neighborhood to cross. The entire length of Liberty needs a green median, like Central Parkway and parts of MLK (in Clifton/Avondale) have. The median is needed partially because older people cannot get accross the street fast enough, and need to stop and rest in the middle. 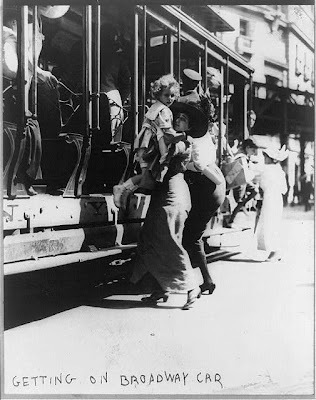 Doesn't look like much fun getting kids in and out of old timey street cars does it? In my opinion trains are the ideal way to travel with children. We just completed a trip in which we rode on several versions of rail travel: Amtrak, two subway systems and one incline. Subways: Kids also like the subway, but it is louder, bumpier and more confusing for kids. In NYC very few of the stops are stroller freindly, and thus it is a very big headache getting in and out. The subway in D.C. however was totally accessible and a much more pleasant ride, being that long stretches of the track run above ground, and kids and parents alike prefer to gaze at passing neighborhoods, not sooty black tunnel walls. Incline: Wow, the kids loved going up the incline in Pittsburgh. Kinda like Charlie and the glass elevator. I wish I had those photos. After this trip, I am more than ever excited about Cincinnati's proposal for streetcars. Above-ground rail travel is the most pleasant and accessible way to travel. Separated grade trains are ideal for longer distances of course, but after seeing the video showing people in wheelchairs rolling on and off street cars in Portland, I am convinced this will be a great way to move around the basin area. I haven't posted lately because I was on a roving vacation. I documented lots of cool playgrounds and child-friendly city activities in New York City and Pennsylvania. Unfortunately, my camera somehow dissapeared in the past few days, and I fear it is lost, along with a memory card with over 100 good photos, many which were intended for use on this blog. Very frustrating.